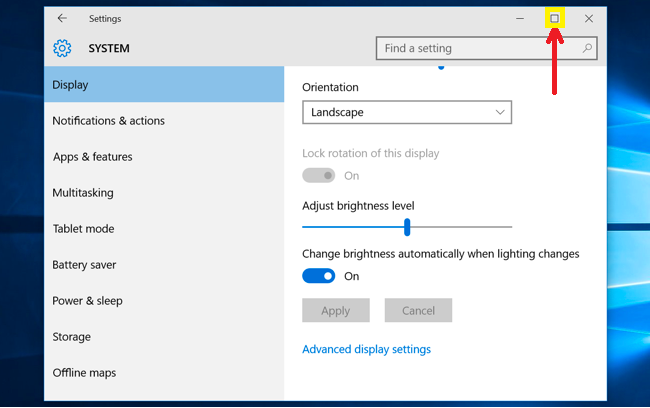 What is this action on computer windows called, “expanding the window”? When pressing on the the double squares on the right upper corner of browsers (Chrome, Explorer, Firefox etc.) or office word, power-point, or almost any window in computers, can I refer it as expanding the window? "Please, expand the screen by clicking on the double squares" would be correct? I'm not sure if this is the verb used to describe what I mentioned. Yes, you can use "expand". But that's a broad term. The specific term for this action is maximize. This is when the window "expands" to cover the entire screen. Two related terms are minimize and restore. When you shrink and hide the window by clicking the _ button, you minimize the window. When it's hidden and you bring it back, that's called restoring the window. Direct shortcut for Windows Maximize/Minimize/Restore window? I asked “him” if he could swim - what is this sentence element called? Is there a word called this Internet action in English culture? Collapse/minimize window to task pane. How to correctly name this action? What do you call these types of windows? What are these lines depicting movement in a cartoon called?